If you’ve been online in the past four days, you’ve probably seen something about Zuckerburg’s huge announcement about the new direction for Facebook (it’s here if you missed it). To make his long message short, he’s once again shaking up the newsfeed algorithm, and this time putting more weight on friends/family posts and lessening the reach of pages unless something is getting great engagement from a friend or family member. This obviously raises a lot of questions for bloggers, especially those of us who are making a living or seeking to earn an income from our blogs. In the short term, navigating these changes will likely be a HUGE headache for content creators like you and me, but in the long term… I think this could have a positive impact across our industry. People used to come to Facebook to connect, to share pictures and life with one another and to get updates about news and the latest drama. Facebook used to be FUN for people. I think as bloggers, it was easy for us to miss the shift Facebook has been in from fun to duty, because we made the change in the way we used Facebook long ago. While our friends and family members continued to use Facebook as a fun, lighthearted social media platform, we’ve been using it for work for years. It’s been our duty to post X number of times to our pages for so long now, we’ve forgotten what it felt like to be on Facebook purely for personal entertainment. Our readers however have had a very different Facebook experience over the last 18 months and it’s been slowly becoming more negative. We are now to the point where I don’t know a single person in my life who would use the word “fun” to describe their Facebook experience anymore. What used to be a pleasant part of the day is now something people must do in order to “keep up”. It’s a duty. Facebook has lost its innocence, and if they don’t make some changes Facebook is going to quickly lose its relevance too. While we bloggers are obligated stay on Facebook, our readers are not – they’d happily jump ship to a better social media platform the moment one comes along, or stop using Facebook altogether if nothing changes. Which is terrifying. So yes, this change is going to be annoying. This is going to be stressful as we wait for these changes to take place and navigate them when they start to happen. But in the end… I truly believe this is going to be GOOD. Facebook desperately needed to change something, and they are! The best part of this is, that in the end our goals as content creators and the goals of Zuckerburg are the same. We all care about having meaningful conversations with people, and creating a space where people can share ideas and connect with one another. Connecting people is the very heartbeat of blogging, and that heartbeat is what Zuckerburg is trying to recreate in the new algorithm. He is currently facing the huge task of figuring out how to diminish the reach of spammy pages, while also allowing meaningful connections to take place around the type of content that you and I create. I do not envy his task one bit. But as he works to figure out what we already know – we can rest in the knowledge that bloggers are what make Facebook truly great. We give voice to things people want to say but don’t know how. We know how to build communities, how to make introverts want to connect with other people and even how to diffuse a troll. Bloggers are community builders, and we’ll be community builders long after Facebook ends. The Facebook algorithm change is coming. It will get messy, but in the end, it’s a step forward for bloggers, we just have to weather the storm first. I’ve been through several huge industry changes in my 12 years of blogging, and this will likely be in the top 5 biggest industry changes I’ve seen. Each time, I’ve learned a little bit more about how to stay strong in my business while huge changes are happening in the industry. Here are a few things you can do today, to help stay out in front of the huge Facebook changes that are going to be rolling out. These tips include paid affiliate links. The most important thing to do is to lock in on your target audience. Remember who you are writing for and WHY and don’t let anything distract you from that. Pageviews may fluctuate, but your most valuable asset is always the core people who follow YOU for YOU and will stick with you no matter what. Lean in to them right now and make sure every business decision you make serves them to the best of your ability. They will help you get through the industry changes more than anything else. Diversify! We talk about diversifying our revenue streams and making sure our pageview sources are diverse all the time… but it’s never more clear WHY this is important than in the middle of one of these changes. I told you at the beginning of the year, that I was going to be shifting my focus to Instagram, and after this Facebook announcement I’m more glad than ever before that I’ve chosen to build up my weaker platforms to perform as well as (if not better) than my stronger platforms. Now is a great time for each of us to evaluate which other platforms could be performing better, and put some extra time into growing one of those platforms. One way I am personally doing this is through Milotree. Milotree is a product I’ve been using a LONG time. Sign up for miltotree here. Milotree is an incredible tool to help you grow your social media platforms. It’s a small SEO-friendly pop up (that won’t irritate your readers) that will encourage your blog visitors to follow you on the social media platform of your choice. I’ve seen HUGE success in using it over the years and can’t recommend it enough!!! You have a lot of customization options so it can match your site, and you can even have it cycle through multiple social media platforms OR just focus on the one main platform you’d like to grow (I have mine set to Instagram-only right now, since that’s my focus). Your email list is going to be massively important over the next few months as well. Even if you don’t have a huge strategy mapped out in your head yet, go ahead and jump in! Create free printables as opt-ins for your list, put an extra sign up link in the bottom of a post that’s doing well, and make sure you’re sending emails to your list! I’ve said it before, but it’s a good reminder that you control your list. Facebook can lose it’s mind but no one can take your email subscribers from you. Sign up for convertkit, and start rounding out your list with new welcome sequences and printables (Valentine’s Day is coming up, it’s the perfect time to create a seasonal welcome sequence for your readers!!!). Convertkit makes this so easy, and is the main reason I’ve started to see much more success with my email strategy in the past year. (I’m hoping to have a Convertkit expert come do a webinar for all of you soon to help you work out any issues you might be having with your email strategy). Sign up for convertkit here. This one is a bonus… take a deep breath… it’s going to be okay! Our industry has seen huge growth in the last few years, and while things are changing a lot this year, content marketing and social media marketing are here to STAY. Focus in on the things you can control right now like building up other platforms, and making the most of your email list, and don’t let Zuckerburg’s business-identity crisis hold you back from creating awesome things for your core readers. You have important things to say to the world, don’t hold back from sharing them just because you’re not sure what tomorrow holds for Facebook. Ps – what are your thoughts on the Facebook identity crisis? Leave a comment and let me know! Check out this post from my friend Kiki about making business pages work. 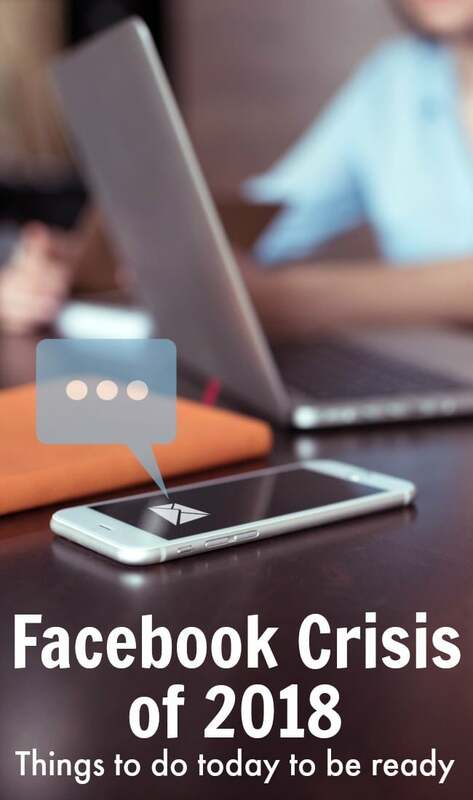 Hey Buddy!, I found this information for you: "The Facebook crisis and what you need to do TODAY to be ready". Here is the website link: https://www.beautythroughimperfection.com/facebook-crisis/. Thank you.